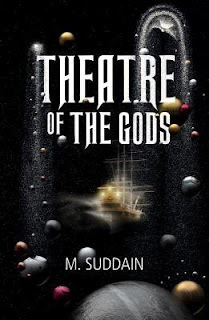 As someone who enjoys big, bombastic science fiction space operas, I've been waiting for a long time for Matt Suddain's Theatre of the Gods, which I first heard of ages ago and was able to read an advance copy of recently even though I'm unaware of any United States release date for it. Theatre of the Gods is indeed ambitious and expansive, with a very unique narration and narrative structure, but ultimately falls underneath its own weight and becomes a little messy and haphazard. The story, in three parts, involves an explorer on a ship with an incredibly differing group of people as a crew. There's a space Pope they're fighting. Some creature called "The Sweety." It's almost pointless to try and derive an overarching plot from this, because part of the ambitiousness of this book is the small mini-tangents that the book and the crew go off on before what ends up being a semi-epic confrontation right at the end. The downside to the book is, unfortunately, the scope and ambitiousness. With so many moving parts and so much going on, it's very difficult to keep tied together from time to time, and the narration (which I could not stop hearing in the voice of Cecil from Welcome to Night Vale) is interesting enough to almost pull you out of the proceedings a bit. With such an epic scope, it ends up being a little frustrating for things to not go the way one might expect in terms of a more linear narrative. A lot about this book is just difficult, and not in a good way. My issues with Theatre of the Gods is ultimately one of too much in one place. Suddain is clearly a very talented writer, and I will almost definitely try out another one of his books, but I wish I had proceeded with more caution on this one on a whole, as it ultimately left me cold and frustrated.